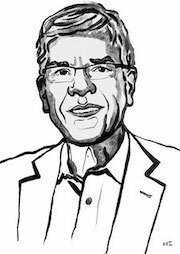 Co-recipient of the 2018 Sveriges Riksbank Prize in Economic Sciences in Memory of Alfred Nobel. University Professor at NYU. Focused on urbanization; cooperation at scale of millions and billions; science; technology; economic development; long-term growth; code as language. Today the FT published an Op-Ed featuring my recommendations for the new President of the World Bank. It’s reposted here with their permission. The original can be found here (paywall). * The official name is The Sveriges Riksbank Prize in Economic Sciences in Memory of Alfred Nobel. Later in this post, I'll say more about why it was so wonderful to be a co-recipient with William Nordhaus. ** Here's a trick question for anyone familiar with economic jargon: What's your estimate of the number of times I use the word "nonrival" in this lecture? When I was working on growth in the 1990s, I wrote an article on economic growth for an encyclopedia of economics. (The links in this post take you to a version of this article that I updated in 2016.) My goal was to provide an accessible introduction to our understanding of growth without shying away from its deep conceptual foundations. We can share discoveries with others. There are incomprehensibly many discoveries yet to be found. The economic jargon for this first point is the "nonrivalry of knowledge;" the jargon from math and computer science for the second point is "combinatorial explosion." I've been pleasantly surprised about how well this article seems to have served its dual purpose. Non-economists have said that it helped them understand why unlimited growth is possible in a world with finite resources. Professional colleagues have been intrigued by the discussion of combinatorial explosion and its interaction with nonrivalry. Specialists and non-specialists have both latched onto the concept it points to of a meta-idea: an idea about how better to discover ideas. 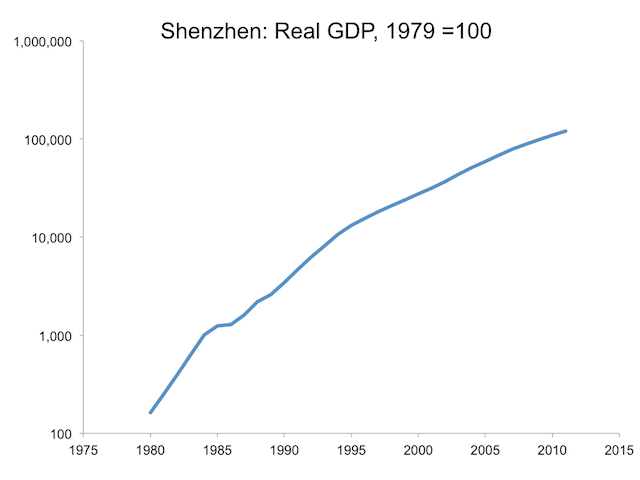 The updated version also makes a point that is not well understood that is captured in the picture to the right: If we treated Shenzhen as a city-state analogous to Singapore or Hong Kong, Shenzhen has the fastest rate of GDP growth ever observed. Over the 30 years from 1980 to 2010, output in Shenzen increased 1000 fold, which implies an average compound rate of growth that exceeds 20% per year.